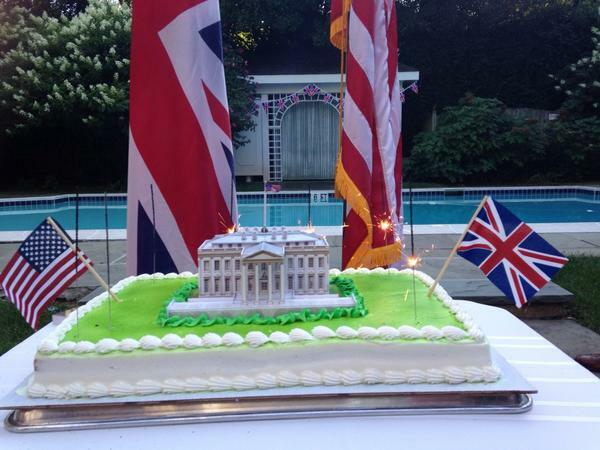 Apparently, if you’re a British diplomat serving in the United States and feeling a bit overshadowed by your bigger and better ally, you simply bake a creepy cake celebrating the destruction of your hated friend’s capitol building and then tweet a commemorative photograph of this governmental goodie to all and sundry. Just a little Monty Python humor to shore-up those flagging members of the British diplomatic corps. Nudge-Nudge, Wink-Wink. Some American citizens, including myself, did not take kindly to the British government making a joke out of a wartime attack perpetrated on American soil by our now supposed friend and ally. And we certainly let the British Embassy know how strongly we felt. So within hours of their Happy White House Destruction tweet, the dimwitted diplomats apologized. But in the wake of that stiff upper lip apology came a slew of withering criticisms from various Talking Heads and commentators, conservative ones included, on how ridiculously politically correct our culture has become. Why should anyone be bullied into apologizing for engaging in lighthearted free speech. It was a Joke! Get Over It! Enough already! Our suffocating political correctness and hypersensitivity to all manner of perceived offenses are among the most tiresome features of modern American culture. We all profess to want to get along in perfect harmony, but these days any joke or quip that is even remotely controversial will get you shipped off to (Chinese style) reeducation camp. Which is why both the British Embassy and Harry Reid buckled under pressure and immediately issued formal apologies. For trying to be funny. Well, I beg to differ. We’re not talking about an individual, representing no one but themselves, making satirical comments that some people might find offensive, comments that touch on wartime violence and racial stereotypes. We’re talking about a branch of a foreign power, and in the case of Harry Reid, a major US government representative, making questionable public remarks and displays in their official capacity. If an individual diplomat working for the British Embassy had sent out that Ha! Ha! We Burned Down the White House! tweet using his/her personal Twitter account, I wouldn’t like it, but I also wouldn’t expect them to apologize for it nor to grovel to my personal sense of proper public discourse. Heck, if they’re going to shove ‘funny anecdotes’ about past military prowess into the communal faces of those nations who got smacked with it, then how about the British embassy in Germany tweeting about celebrating the firebombing of the city of Dresden. That’s sure to get a lot of laughs. What?? That’s in poor taste you say? Really?? The firebombing of Dresden occurred almost 70 years ago—maybe the Germans need to get over it already. That episode still resides in recent history and is totally taboo you say? Well then, how about a little jocularity over the hanging of Nathan Hale during our Revolutionary War. Now that would be a hoot. After all, his execution was well over 200 years ago and celebrating the stringing up of an American patriot and then tweet-slamming it at the American public would be nothing more than British comedic kitsch. Turn up the laugh track, America. Bottom line, the tweet was in poor taste—the British Embassy represents the British Government and they should have known better. Their tweet was….let’s see, what’s that word…oh yes, UNDIPLOMATIC. But come on folks…we all know why the British Embassy went to the bother of baking a celebratory cake over the burning of the White House by British troops in 1814 and then tweeting out a photo of this cocky confection to the entire world—it was just another of many moments of small-minded, petty, petulant, and public school boy jealousies directed at their little American brother who has grown so much taller and so much stronger than their own puny body politic. As the UK slips into its sunset years, their snotty ruling elite need to find some vestige of past glory to rub in the face of their once-upon-a-time protégé. After all, us American Yahoos did whip their butts in 1814 and then saved their rear ends in two World Wars. That’s got to be real tough for their Oxbridge brains to process especially when their whole British persona is based on a pretense of cultural superiority. So British Embassy, here’s flipping the bird right back atcha…. This entry was posted in Political/Social and tagged Battle of New Orleans, British Embassy, Harry Reid, Oxbridge, Twitter, War of 1812, White House. Bookmark the permalink. Nice to see you posting 🙂 As a bakery owner and cake decorator, I want to know who made the dang cake? I can tell you I would not even entertain the order, no matter how much they were willing to pay. Hi there, Mary. I bet the British Embassy has its own pastry chef along with a large kitchen and wait staff–the Brit diplomatic corp gets treated like royalty.